Here’s a whimsical little jacket to add some zing to your wardrobe! This cardigan is a fairly quick knit, as it’s knit from the top down in luscious Malabrigo Worsted yarn on size 11 needles. 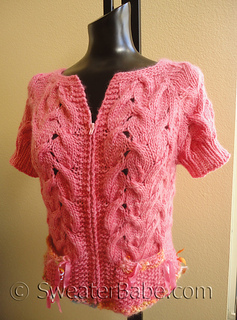 Sleeves and body are worked in a unique, all-over cable and lace pattern that gives the cardigan lots of lovely texture and visual interest. 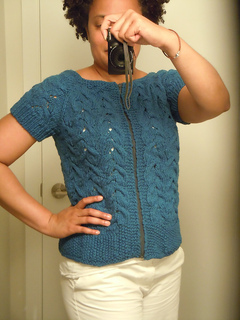 Garter stitch neckline, front bands, and ribbed sleeve edgings provide nice contrast and finished edges. And then, accent pockets are knit in, with a very special yarn from Namaste Farms called “Charmed – Hello Kitty” in a special color that Natalie, of Namaste Farms, calls “Babe” just for me! Notice the fabulous Hello Kitty charms and fancy ribbon! 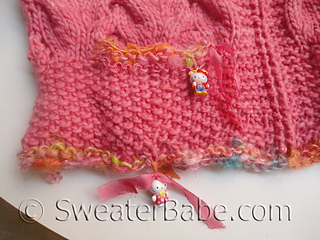 The bottom of the cardigan is also edged in Babe, to liven things up. A zipper is then sewn in. 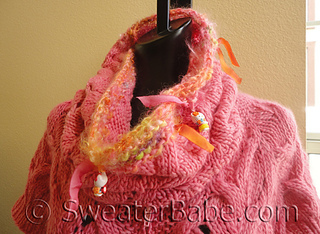 Matching cable and lace cowl can be worn with or without the cardigan. 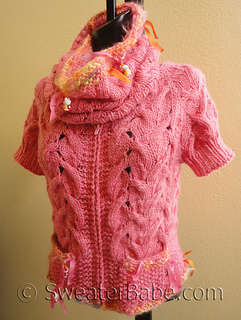 Because this is a top-down design, sleeves can easily be made 3/4 length or long by continuing the knitting. And the zipper can be replaced with another closure too!